Get news for restaurants in Los Angeles. Learn more about what's going on in your dining community. From chefs to new restaurants, you'll get the most out of Los Angeles restaurants when you know what's going on. 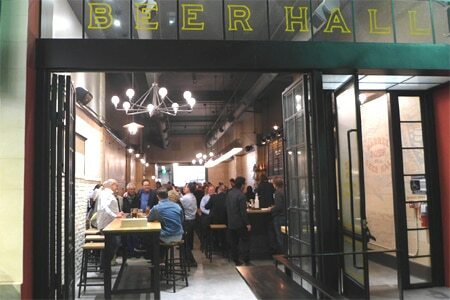 Barrel Down in downtown Los Angeles features 40 taps of American craft beers plus cocktails. 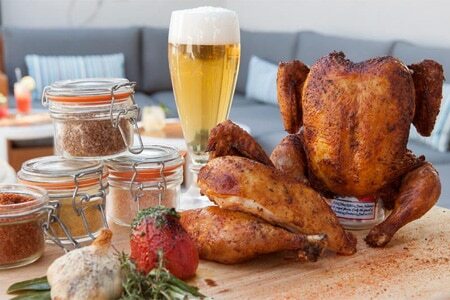 Chef Derrick de Jesus offers modern takes on "Americana food" designed to pair well with the brews. Barrel Down, 525 W. Seventh St., Los Angeles, CA 90014, 213-232-8657. Forma Restaurant & Cheese Bar is now open in Santa Monica. Executive chef Piero Topputo features a unique dalla forma preparation, in which freshly cooked pasta is tossed in a large wheel of Parmigiano, Pecorino, Romano or Pecorino Gran Cru cheese. A custom floor-to-ceiling glass cheese case and bar were created to set the stage for diners to watch the dalla forma preparation. In addition to pastas, Forma’s menu offers flatbreads, risottos and a selection of main dishes including artichoke and fennel casserole and grilled octopus with lentils. An extensive cheese program highlights a vast selection of semi-soft, semi-hard, hard, soft-ripened, blue-veined and washed-rind cheeses. Forma Restaurant & Cheese Bar, 1610 Montana Ave., Santa Monica, CA 90403, 424-231-2868. 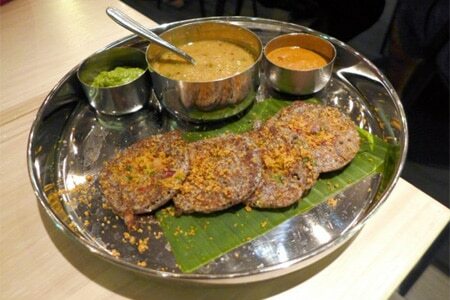 Chef Akasha Richmond (Akasha) has opened Sāmbār, a modern Cal-Indian restaurant in the former Ford’s Filling Station space in Culver City. Sāmbār, 9531 Culver Blvd., Culver City, CA 90232, 310-558-8800. Four Seasons Hotel Westlake Village strengthens their culinary program with the opening of Stir, a coffeehouse featuring Stumptown Coffee drinks along with grab-and-go food items. Sweet items include citrus marmalade scones, zucchini walnut bread and gluten-free chocolate chip muffins. Looking for something savory? Expect panini sandwiches and salads like the EVOO salmon salad with baby kale, blueberries, spiced sunflower seeds and avocado vinaigrette. Stir, Four Seasons Hotel Westlake Village, Two Dole Dr., Westlake Village, CA 91362, 818-575-3000. “Stop in, and fuel up” at Gasolina Café, a Spanish-influenced restaurant with modern design flourishes from Sandra Cordero and John Hensley. The indoor-outdoor café features fast-casual service, bright red chairs, an open kitchen and visual references to vintage service stations. Cordero, who is half Spanish and half Dutch, changes her menu seasonally. For breakfast, expect house-baked pastries, several variations on pan con tomate, and breakfast stew with garbanzo beans, spinach and poached egg. For lunch, salads and sandwiches predominate, including the signature Cordero, a lamb burger with house-made cucumber relish, romesco sauce, lettuce and avocado. To drink, turn to the chic bar, which showcases James Coffee Co. and Art of Tea. Breakfast & Lunch daily. Gasolina Café, 21014 Ventura Blvd., Woodland Hills, CA 91364, 818-914-4033. Jane Lockhart has had a dessert-fueled hit on her hands since she debuted the first Sweet Lady Jane on Melrose in 1988. Encino marks the fourth outpost, which delivers fast-casual service, breakfast and lunch daily, and an array of cakes, pies and sweets. At breakfast, challah French toast and quiche Lorraine are popular. At lunch, sandwiches star, featuring options like curried chicken on house olive bread or tuna salad on rosemary bread. For dessert, expect slabs of chocolate layer cake, cheesecake, seasonal pie and photo-friendly tarts. Breakfast & Lunch daily. Sweet Lady Jane, 16403 Ventura Blvd., Encino, CA 91436, 818-783-8188. Matthew Kenney’s Plant Food and Wine is slated to open June 4, 2015. It will offer a selection of locally sourced, plant-based fare, accompanied by an extensive wine list of organic and biodynamic varietals. 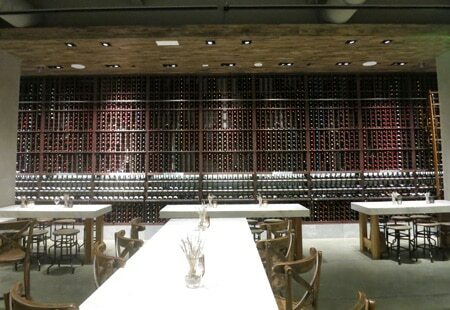 The 65-seat restaurant includes an open-air courtyard, fireplace and a wine room. Plant Food and Wine, 1009 Abbot Kinney Blvd., Venice, CA 90291, no phone. Tender Greens, the fast-casual, sustainable dining concept from Erik Oberholtzer, Matt Lyman and David Dressler, opens its 18th branch in Glendale with executive chef Daniel Schaffhauser. The restaurant has become known for salads and grilled proteins, and the Glendale outpost sticks with what works, though you’ll also find new dishes like duck confit salad with kale, frisée, fried egg, roasted shallots and sherry vinaigrette. Crispy falafel is available with plant-based sides like roasted Weiser Farms potato salad or roasted carrots with toasted fennel seeds. Schaffhauser, who hails from France, also plans to rotate specials like grilled ocean trout with beurre blanc. The space, which Hatch Design Group designed, features an outdoor patio, wood panels and polished concrete. Lunch & Dinner daily. 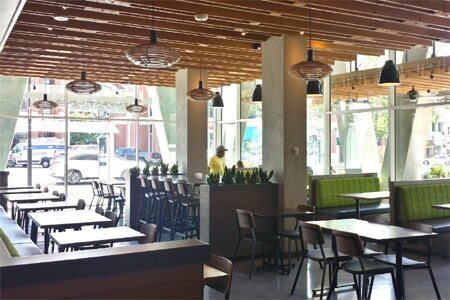 Tender Greens, 145 N. Brand Blvd., Glendale, CA 91203, 818-459-4850. Estrella on the Sunset Strip will feature globally influenced California cuisine from executive chef Dakota Weiss ("Top Chef"). The restaurant, which is named after the "circus girl" mentioned in the Joni Mitchell song "Ladies of the Canyon," will have a bohemian vibe. Look for a Fall 2015 opening. Estrella, 8800 Sunset Blvd., West Hollywood, CA 90069, no phone. Inglewood’s popular Orleans & York Deli has opened a sister spot in downtown L.A. near Pershing Square, serving up shrimp, catfish and oyster po’ boys, muffulettas, gumbo and other Big Easy favorites, alongside New York classic deli sandwiches. Lunch & Dinner daily. Orleans & York Deli, 333 S. Spring St., Los Angeles, CA 90013, 310-671-6200. Chef Eric Greenspan has transformed the shuttered patio of his former restaurant The Foundry into Maré, with a focus on Mediterranean seafood. The front of the restaurant remains the Melrose Umbrella Co. bar, and the entrance to the new eatery is through Greenspan’s Grilled Cheese. Dinner nightly. Maré, 7465 Melrose Ave., Los Angeles, CA 90046, 323-592-3226. Silver Lake now has a New England-style seafood shack to call its own, Knuckle & Claw, located on Sunset Boulevard. The star of the short menu is the classic lobster roll, made with solely knuckle and claw meat, served on a split roll with mayo and butter. There’s a Dungeness crab and blue crab version as well, one with Maine shrimp, and chipotle corn or bacon clam chowder served as sides. Find limited seated in the airy storefront, and a few patio seats outside. Lunch & Dinner daily. Knuckle & Claw, 3112 W Sunset Blvd., Los Angeles, CA 90026, 323-407-6142. Chef Jason Neroni and Bill Chait have launched Catch & Release in Marina del Rey, in the former Paiche space. Expect inspired seasonal seafood ranging from fresh oysters, Nantucket Bay scallops, and a baja shrimp cocktail to mussels with a mustard-cider broth, fried haddock with green goddess slaw, and Sausalito trout with pea and pistachio velouté. Catch & Release, 13488 Maxella Ave., Marina Del Rey, CA 90292, 310-893-6100. Ixta Cocina and Mercado partners Jesse Gomez and chef Jose Acevedo have opened their third concept, a Mexican seafood restaurant called Maradentro in Studio City. Designed by Ana Henton with nautical inspiration, two dining rooms lined in wood allude to the hull and cabin of a ship. Menu items include lobster guacamole, oysters “Rajafeller,” ceviche tostadas, and chile relleno de siete mares; also expect versions of favorites from the sister restaurants like "dos gringas" shrimp tacos and slow-cooked carnitas. To drink, find Mexican-inspired craft cocktails, a good selection of tequilas and mezcals, and a short beer and wine list. Dinner nightly. Maradentro, 11929 Ventura Blvd., Studio City, CA 91604, 818-358-3423. Barrel Down will open in downtown Los Angeles on May 28, 2015. This bar/restaurant features 40 taps of American craft beers plus cocktails. Chef Derrick de Jesus offers modern takes on "Americana food" designed to pair well with the brews. Barrel Down, 525 W. Seventh St., Los Angeles, CA 90014, 213-232-8657. To celebrate its 10th anniversary, the popular Peruvian Hollywood restaurant Los Balcones has launched a new brunch menu. Highlights feature buttermilk ricotta pichuberry pancakes with spiced fruit syrup; pork belly with sweet potato and a sunny side up egg; and chicken tamales with salsa criolla. Also, expect signature ceviches, salads and a selection of Peruvian entrées during brunch hours, along with a Peruvian-inspired bottomless Bellini made with fresh tropical fruit. Los Balcones, 1360 Vine St., Los Angeles, CA 90028, 323-871-9600. Terrine has a new once-weekly lunch service available every Friday, with French-inspired Californian dishes from chef/partner Kris Morningstar. Replacing the former Friday brunch, the new lunch menu features the Terrine burger with truffle butter and a fois gras option, porchetta with shaved fennel, and a classic tuna Niçoise. New cocktails from head bartender Ryan Wainwright feature a gin and tonic with Bombay East and house lemongrass yuzu tonic. Terrine, 8265 Beverly Blvd., Los Angeles, CA 90048, 323-746-5130. EVELEIGH is open daily for lunch from 11 a.m-2 p.m. Executive chef Jared Levy has created new menu items such as crab toast sandy with butter lettuce, barrel-aged fish sauce vin and chili mayo; Jidori chicken breast with roasted eggplant, red onion, black sesame, toasted cumin yogurt and lemon; and burrata & ramps with fennel, tomato and pangrattato. To drink, find kumquat lemonade or cocktails like the "whiskey smash'" with Rittenhouse rye, fresh lemon and mint. EVELEIGH, 8752 W. Sunset Blvd., West Hollywood, CA 90069, 424-239-1630. Alma Offers à la Carte Menu Tues.-Thu. At Alma, chef Ari Taymor is now offering an à la carte menu Tuesday through Thursday only, in addition to the nine-course tasting menu, which is available all seven nights. À la carte items include starters like seaweed and tofu beignets with yuzu kosho and lime, and English muffins with uni, buratta and caviar; mains feature a stew of cod and favas with preserved citrus and carpenter’s pigeon with onions, yeast and fermented cherry. Alma, 952 S. Broadway Ave., Los Angeles, CA 90015, 213-244-1422. Pistola has launched its “L’Aperitivo Italiano” from 5 p.m.-7 p.m. in the bar area only. Mixologist Aaron Melendez offers house cocktails including the Negroni and Old Fashioned for $8 each, and chef Vic Casanova’s refined Italian bar snacks include meatballs, fried squash blossoms, local burrata crostino and bone marrow al forno. Salute! Pistola, 8022 W. Third St., Los Angeles, CA 90048, 323-951-9800. The Roof Garden at The Peninsula Beverly Hills is bringing back its weekend bbq series featuring executive chef David Codney’s take on barbecue specialties. Dishes include Pabst Blue Ribbon beer can chicken with charred corn and cabbage cilantro slaw; chipotle and coffee rubbed tri-tip with house-made oak-aged sauce; and a banana split with cinnamon ice cream, tostones and rum-raisins. This à la carte barbecue menu is available through September on Saturday and Sunday evenings only. The Roof Garden, The Peninsula Beverly Hills, 9882 S. Santa Monica Blvd., Beverly Hills, CA 90212, 310-975-2855. 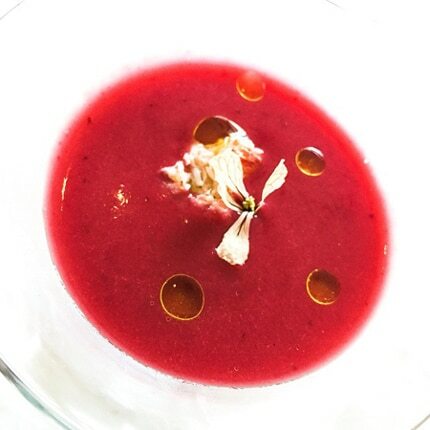 Il Grano is celebrating cherry season with different varieties and preparations each week, such as cherry gazpacho with lobster. Il Grano, 11359 Santa Monica Blvd., Los Angeles, CA 90025, 310-477-7886. The Larchmont celebrates its two-year milestone by opening the doors of its Craftsman-style bungalow for brunch. Executive chef Kevin Kathman’s contemporary California menu includes deviled eggs with smoked whitefish, caviar and Meyer lemon; the “Stoner” with peanut butter crunch French toast, maple bacon and roasted banana --- with an option to add foie gras --- and “King Crab” with butter-poached crab, Béarnaise, crispy potato and poached eggs. Brunch hours are Saturday and Sunday from 10:30 a.m.-3 p.m. The Larchmont, 5750 Melrose Ave., Los Angeles, CA 90038, 323-464-4277. Chef David Féau (ex-Patina and The Royce) has taken the reins of the kitchen at Wally's Beverly Hills. This spinoff location of the the iconic Los Angeles wine store Wally’s was originally more of a wine and gourmet store, but now the restaurant and bar part is the focus. Wally's Beverly Hills, 447 N. Canon Dr., Beverly Hills, CA 90210, 310-475-3540. Lattitude Thai Restaurant in Santa Monica has been replaced by RIZE Thai & Sushi Infusion. Lattitude Thai Restaurant, 2906 Lincoln Blvd., Santa Monica, CA 90405, no phone. After 30 years, rising rents on Abbot Kinney forced Venice neighborhood favorite Hal’s Bar & Grill to close. The owners of the restaurant hope to relocate nearby. Hal's Bar & Grill, 1349 Abbot Kinney Blvd., Venice, CA 90291, no phone. Brilliantshine, the cocktail-and-small-plate spot in Santa Monica, has closed. Brilliantshine, 522 Wilshire Blvd., Santa Monica, CA 90401, no phone. Discover the top restaurants in Los Angeles for various cuisines and categories like sushi, steakhouses, pizza, happy hours, romantic dining and even gourmet food trucks. Find the best restaurants in LA here!